For her ninth birthday, Charlotte asked for a yoyo. Apparently hearing only the vowels, her parents instead gave her an oboe. 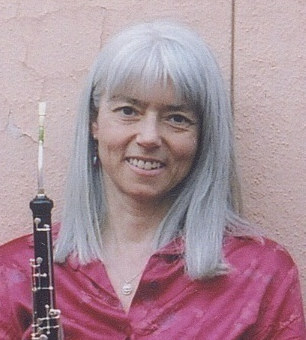 She subsequently learned to play at the University of Cincinnati College Conservatory of Music, studying for eight years with Ferdinand Prior, the Cincinnati Symphony’s English horn player. She also studied at Indiana University. In 1996 she joined the Salt Lake Symphony. Playing in the orchestra continues to be a highlight of her life. Charlotte has also performed and/or recorded with blue haiku, Anke Summerhill, Scherzando Winds, John Flanders, Kate MacLeod and Smithsonian Folkways. A Yoga teacher since 1986, she is the author of two books: Mindful Yoga, Mindful Life (2007) and Yoga for Meditators (2012), both published by Rodmell Press. She also writes a monthly column for Catalyst Magazine, edits and writes blogs for Hugger Mugger Yoga Products and Yoga U Online. Her writing has been published in Yoga Journal, Yoga International and the online publications, YogaDork and elephant journal. In 2013 she founded Mindful Yoga Collective in Salt Lake City, a collective of the city’s most experienced teachers.